These homemade Beer Bread Biscuits with Herbs come together quickly with no shaping and no cutters. All you’ll need is a bowl, spoon, and muffin tin to make these incredibly delicious and golden biscuits. Make some today! The thing I enjoy the most about these easy Beer Bread Biscuits with Herbs is how quickly they come together. From the time you decide to make them, from the time you can actually eat one (or more) is roughly one hour, and that’s simply because I don’t want you to burn your mouth on a biscuit that is too hot! LOL Safety first, kids! 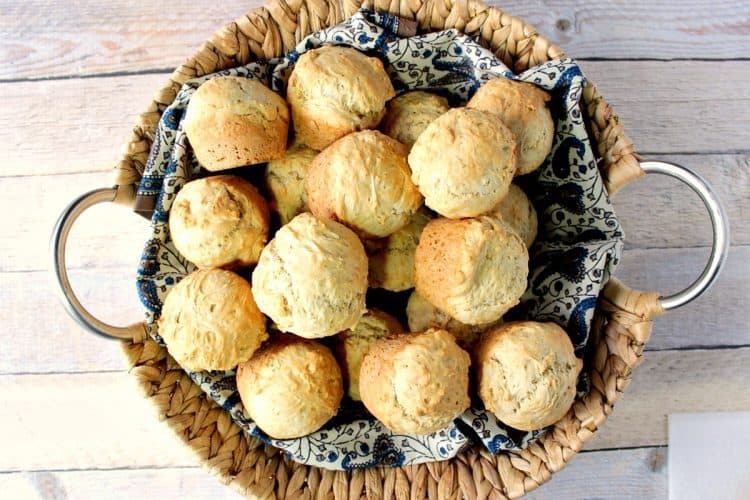 **Please Note – The printable recipe card with detailed instructions and complete ingredient measurements for making One Bowl Beer Bread Biscuits with Herbs along with a quick video presentation, is available near the end of this post. You’ll also need a large bowl, a wooden spoon or spatula, baking spray, a whisk or fork, measuring spoons, measuring cups, a muffin tin, and either a tablespoon or a medium ice cream scoop. When I last made these biscuits, I made a double batch because I was serving them as a side dish on my Thanksgiving 2017 dinner menu. Everyone enjoyed their herbed flavor and mildly crumbly texture. 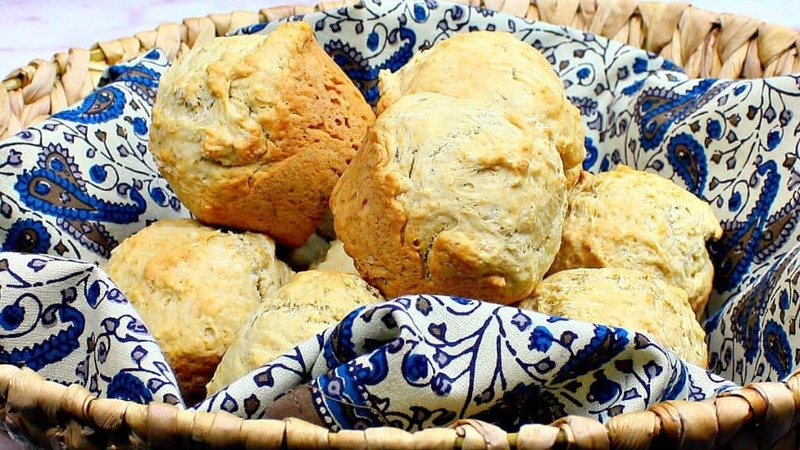 The beer is almost undetectable in the flavor of these Beer Bread Biscuits with Herbs, and yet the beer lends what I would call a light yeasty taste and aroma, even though there is no yeast in the recipe. Magic! 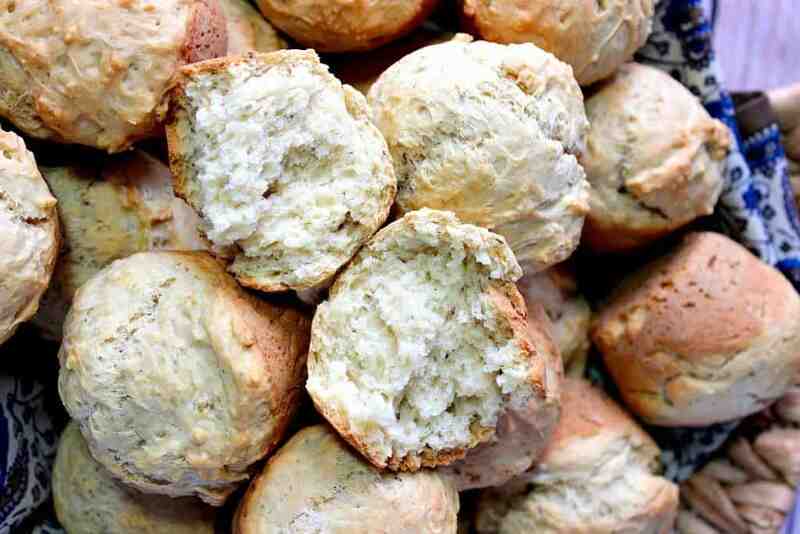 Making One Bowl Beer Bread Biscuits with Herbs is easy fast and easy! Let’s get cooking! In a large bowl, whisk together the flour, baking powder, salt and brown sugar. Add the beer. Stir to combine. Add the olive oil and stir again. Spray a muffin tin with baking spray. Fill the muffin tin with approximately 2 tablespoons of batter. Bake in a preheated 375-degree oven for 30 – 35 minutes, or until golden brown. I did my best to produce the following fun and fast-paced video of the making of Fast and Easy Beer Bread Biscuits with Herbs. I hope you’ll find it entertaining and helpful. If you enjoy this video, please don’t forget to subscribe to my Kudos Kitchen channel on YouTube. Thanks so much!! These homemade Beer Bread Biscuits with Herbs come together quickly with no shaping and no cutters. All you'll need is a bowl, spoon, and muffin tin to make these incredibly delicious and golden biscuits. In a large bowl, whisk together the flour, baking powder, salt, brown sugar, and dried herbs. Stir in the beer and olive oil. Mix well. Spoon approximately 2 tablespoons of the batter into each muffin cup. Bake in a preheated oven for 30-35 minutes or until the muffins are golden brown. 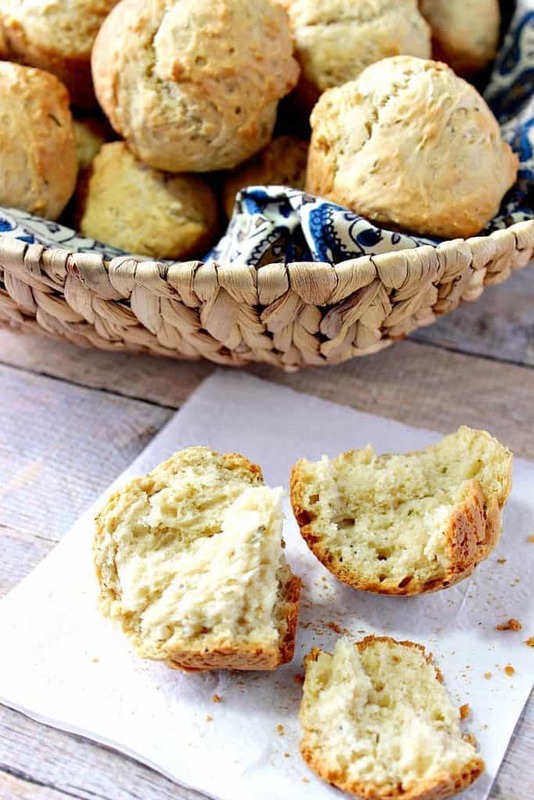 I sincerely hope you’ve enjoyed this recipe for One Bowl Beer Bread Biscuits with Herbs as much as I’ve enjoyed bringing it to you! Should you have any questions regarding this, or anything else you see on my site, please don’t hesitate to contact me directly, or leave me a comment in the comment section below. It is always my distinct pleasure to get back to you with a reply just as soon as I possibly can! So delicious and easy! My roommates leave half finished beers around, and I confess that’s what I used. So I wasn’t sure it would work as well as with fresh beer. Also used fresh rosemary, super happy with the results. Thanks for your inspiration!